"Bacon: A Love Story" These words roll of my tongue as the meaning of life. Bacon makes the world go round. Ms. Goofy and I have been on a quest to find the 'Gold Standard of Bacon.' There is a whole nation that loves bacon. Somebody should write a book. That somebody is Heather Lauer from Bacon Unwrapped. Heather has compiled a book that celebrates cured pork belly. There will be sections devoted to cooking, recipes, history and a whole lot more. It is a comprehensive text of all things bacon. The best part will be that yours truly, Chilebrown is a contributor. Yes, the Mad Meat Genius will be immortalized for all history to behold. Am I glowing? 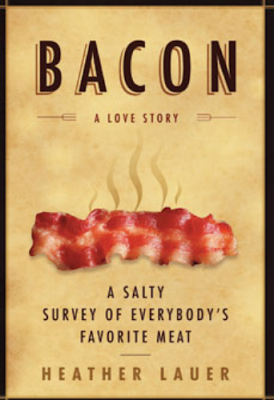 "Bacon: A Love Story" will hit the shelves May 12. This would make a perfect Fathers Day gift. You can pre-order this book from Amazon by clicking the link below. I can't wait to see your contribution. Congrats! Can't wait to see it. Congratulations man! If anyone deserves to be a contributor to a bacon book, it's you. Are you going to put "Official Bacon Consultant" on your business cards, now? Congrats! Can't wait to see your part!